Planetpals Exclusive ANY holiday box shaped ornament cut design and paste craft "
Use it for Christmas, Hanukah, Kwanza or any special occasion. 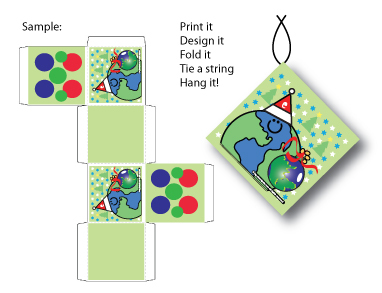 Join the Planetpals in celebrating any holiday with this free Planetpals box ornament. It's 6 sided and easy to make. 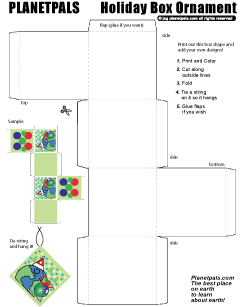 Print, Decorate, Cut and Tie it with a string and hang it up. Use it for Haloween, Christmas, Hanukah, Kwanza or any special occasion. It even makes great decorations for birthday parties. You can enlarge the pattern to make larger boxes. Be an even better Planetpal: Please use recycle paper or cardboard to make it out of and use it year after year! To decorate this ornament--cut out images from magazines or old wrapping paper. Or draw your own designs, color, paint or use clip art on it! 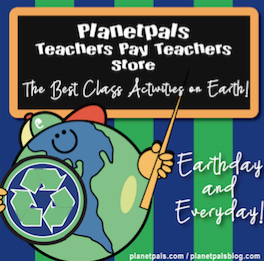 See the other fun things at Planetpals Earthzone!